For the past three years of my life, one of my most consistent meals has been Thai take out. Yup, once a week almost every week. Shortly after moving to Chicago, I found my local Thai restaurant. They happened to be a five minute walk from my apartment which was a nice perk. I was making my way through their menu, having gotten more than halfway through, but sadly we had to part ways when I moved to Brooklyn and now I'm still searching for my new place. Surprisingly, I rarely order pad thai at restaurants. I always find the sauce to be too sweet or too sour, or the noodles to be too clumpy, so I started making my own a few years ago. It's not difficult at all, the most frustrating part is julienning the carrots, but that's because I'm just an impatient person with bad knife skills. My favorite meat to use in pad thai is head-on shrimp; the sweet head juice imparts a flavor you can't get elsewise. Unfortunately they're a little hard to find outside of Chinatown. 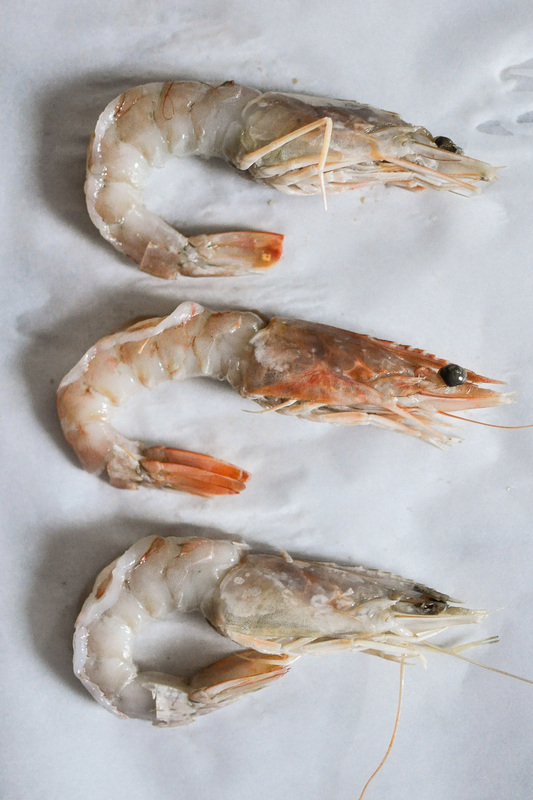 I got mine at a local fishmonger that only sold big head-on prawns at $20 a pound. They were huuuuuuge, 11 shrimp to a pound. If you can make your way to your nearest Asian supermarket you can get them for a lot cheaper (and a lot smaller in size too, but still tastes the same). I used to go to Super H Mart in Chicago where they were $6 a pound. 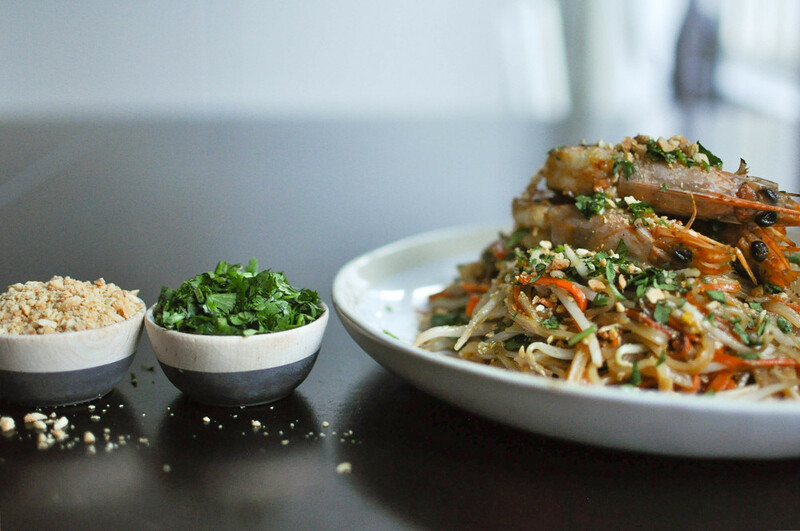 You can double the sauce if you plan on making pad thai again within a month, then it's just one less step to take. The key to a good pad thai is a really hot pan. I highly recommend getting a wok. I use a cast iron (over carbon steel) wok because it retains heat better. Most conventional American ranges don't have the BTU output to get a steel wok or skillet hot enough and maintain that searing hot temperature all the way through the cooking process. Regardless of what you're using, remember not to overcrowd the pan, you could even go as far as making one serving at a time if need be. Combine tamarind concentrate, palm sugar, fish sauce, and half of the garlic in a small saucepan. Bring mixture to a boil, turn down heat and simmer until sugar has dissolved. Set aside. Heat up 3 to 4 quarts of water until just before boiling. Turn off heat, add noodles and soak for 15 minutes until very al dente, they should have a good bite. Drain and set aside. On the highest heat setting, heat up 2 tbsp of oil in a wok and add the shrimp, toss gently (you don't want the heads to fall off from moving them around too much) to get a good sear on both sides, 2-3 minutes. Transfer to a bowl and set aside. Heat up remaining 2 tbsp of oil. 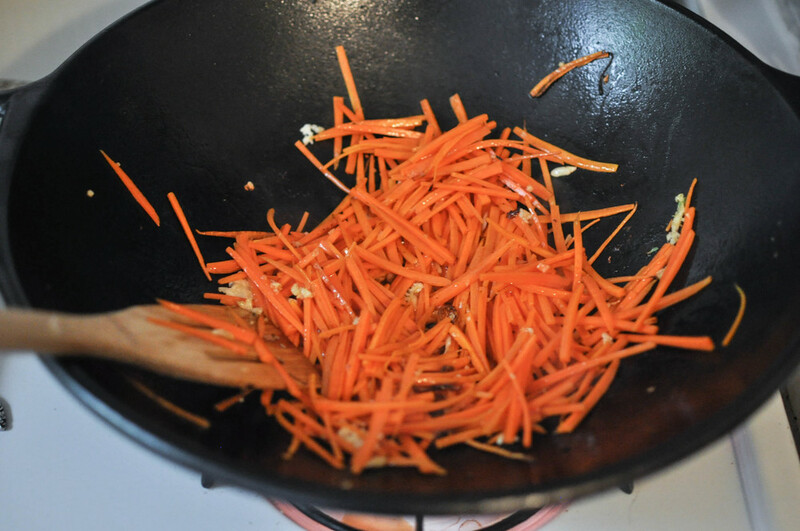 Add garlic, carrots, and chili flakes if using and fry for 1 minute. Add noodles and pad thai sauce, toss to combine and cook for 1 to 2 minutes. Push the noodle/carrot mixture to one side of the pan and add eggs, quickly scramble them around with your spatula until cooked through. 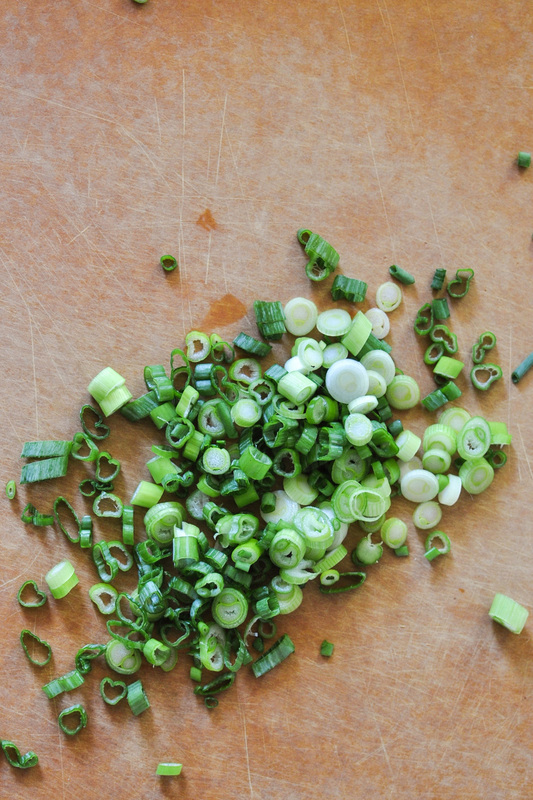 Add scallions and bean sprouts and cook for an additional minute. Turn of heat and plate noodles immediately. Place half of the shrimp on each plate. Top with peanuts and cilantro.